Going on foot is an excellent choice for those who are living or working in the close proximity of the Lotto Arena. No traffic delays and no parking problems. 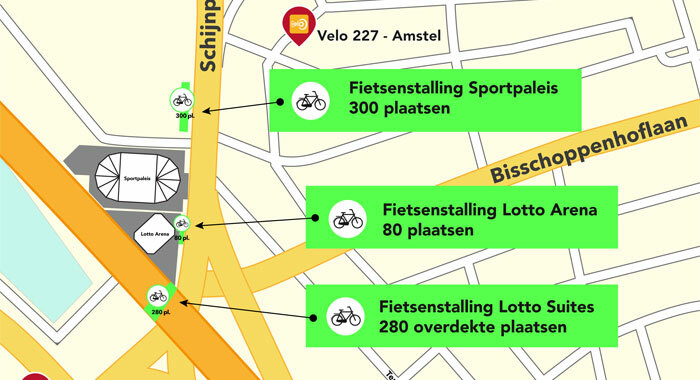 For those who like to bike, we have 660 bike parking racks available close to Sportpaleis and Lotto Arena (click image to enlarge). You can also rent a bicycle provided by the city of Antwerp at many locations via Velo Antwerpen. If you’d like to take a cab, please make sure to read the following, as it will ease and quicken your travel to/from the Lotto Arena. BEFORE an event, you can ask your driver to drop you off at the curb in front of the entrances. AFTER the event we advice you to walk to the taxi stand in the Van der Delfstraat, the small street just opposite the venue. For some events you can also use the ‘Event Touring’ service. Coach company Reizen Lauwers will bring you from several spots to Antwerp. You’ll find a clickable button on the page of any event which offers this service. Thanks to ‘Event Touring’, you can travel without any worries about parking space or traffic. Just order your seats for the coach which stops in your neighbourhood. The driver will bring you to Antwerp and will bring you back to the spot where he picked you up, after the event. Want to attend an event but you’re living in Paris or Barcelona? Brussels Airlines offers super deals for flights out of almost every major city in Europe. Book your flight today. By using public transport together with other visitors, your fun already starts before you reach the venue. A combiticket lets you complimentary leave your commuting stress at the door and allows you to relax during your travel to and from the venue. No traffic, no endless looking for parking spots and definitely no queuing to leave the parking space after the event. Keep in mind that returning home by train after an evening event is often not possible anymore. So please check in advance if a smooth travel homewards will be possible. Or you can try combining your outward journey with carpooling during your ride home. Near Antwerp Central Station you can find the Astridplein, where you can easily transfer on various trams and buses. Your combiticket let’s you make use of complimentary public transport offered by De Lijn. Make your journey more comfortable: avoid the neighbourhood of the Sportpaleis, park at a Park+Ride and continue your commute to the venue by tram or bus. Your combiticket Sportpaleis/Lotto Arena – De Lijn is a valid ticket for public transport! Together the P+R-lots offer parking space for almost 2.000 vehicles. Park at one of the Intercity parking lots at Roosevelt, De Keyser, Hopland or Horta and continue your journey by using public transport to the Lotto Arena (complimentary use of trams and busses with your entrance ticket). By validating your parking tickets at the pedestal near the front desk, you’ll only pay 4 euros for 6 hours of parking. In case of serious traffic issues in the surroundings of the Sportpaleis/Lotto Arena or bad weather conditions we’ll try to do our utmost to let the event start when the majority of the audience is inside. Before the start of an event we always publish a webpage on which you can check which parking spaces are available. Make sure to check this page out before you leave, especially when simultaneous events are taking place in the Sportpaleis and the Lotto Arena. Since 1 February 2017, the entire city centre of Antwerp and part of Linkeroever are a Low Emission Zone where the most polluting cars are no longer welcome. Our parking spots Slachthuis and Park Spoor Oost are situated in this zone, which is indicated with its own traffic sign. Need a rental car? Call Europcar! Are you looking for a rental car to travel to and from our venue? Our partner Europcar offers a wide variety of vehicles at very attractive rates.